The Allstate Corporation was founded in 1931 at the height of the Great Depression. Sixty years later it became a publicly traded company. It has gone on to become the largest publicly traded property and casualty insurer in the United States. Ever since its establishment as part of Sears, Roebuck and Co. back in 1931, Allstate has gone from strength to strength. Since 1995, the company has been completely independent after Sears divested all remaining shares to its stockholders. A lot has changed since the early days of auto insurance, with Allstate going on to become one of the most trusted insurance providers of the modern age. It has been ranked as #2 on Forbes' list of Most Admired Companies in the propert and casualty sector. Information Week named Allstate as one of the top 50 most innovative users of IT in the nation with their Next Generation claims system and Consumer 2.0 technology. They are named as one of the top 50 companies catering to hispanic people in their online and published material. The Allstate auto insurance and property plans are undoubtedly market leaders, and rightly so. By using NAAIP's intuitive free agent website to generate more business, it is easier to sell these attractive products to your clients. 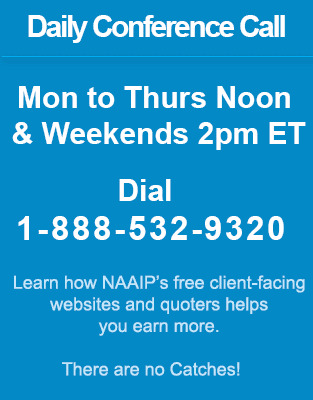 Sign up for yours today and let NAAIP help you to help yourself.